The network is the foundation for application delivery. Next-generation networks need to meet the growing challenge of effectively delivering applications and services in complex IT environments, where reliable application performance is vital to business success. New applications need to be successfully deployed. Network resources need to be available and used wisely. Performance degradations need to be identified and resolved before they affect business. The Cisco Network Analysis Module (NAM) provides unparalleled visibility into how your network is performing and how your users experience the delivery of applications and services to help you understand and improve application performance. The broad portfolio of Cisco NAMs, which encompasses integrated services modules, self-contained appliances, and now virtual service blades, arms you with what you need to manage performance from the branch to the data center. Introduced in NAM 4.0, the Cisco NAM 2200 Series Appliances offer next-generation performance, superior scalability, and maximum deployment flexibility to deliver exceptional performance monitoring throughout your Cisco network. The design of the Cisco NAM 2200 Series Appliances is founded on the Cisco Common Appliance Model, Cisco's computing-optimized platform, and includes purpose-built hardware to maximize packet processing in high-speed networking environments. The results are robust appliances that provide granular traffic analysis, rich application performance measurements, comprehensive voice quality of experience monitoring, and deep insightful packet captures. Cisco offers two appliances models, the Cisco NAM 2220 Appliance and the Cisco NAM 2204 Appliance. The Cisco NAM 2220 Appliance includes two 10 Gigabit Ethernet monitoring interfaces and six 146 GB Serial Attached SCSI (SAS) hard disk drives with RAID for multiservices monitoring in high-speed, high-density environments. The Cisco NAM 2220 comes with an option for redundant power. To extend uptime, both the hard disk drives and the power supplies are hot-swappable. The Cisco NAM 2204 includes four 1 Gigabit Ethernet monitoring interfaces and two 250 GB Serial Advanced Technology Attachment (SATA) hard disk drives to meet diverse performance analysis needs in scalable multigigabit switching and routing deployments. The Cisco NAM 2200 Series Appliances also include the embedded, web-based Traffic Analyzer GUI, which provides quick access to both configuration menus and easy-to-read performance reports. The GUI can be accessed from any desktop, eliminating the need to send personnel to remote sites or haul large amounts of data to the central site. To enhance security, role-based access can be assigned and web browser access can be secured with up to 256-bit encryption. The Cisco NAM offers an extensive set of features (Table 1) that provide a multilayer view of network performance to help you successfully navigate the labyrinth of application delivery challenges in today's hyperconnected world. They provide the foundation of knowing, giving you the edge in managing and improving network and application performance. Deployment flexibility As a self-contained device, you can deploy the Cisco NAM Appliances anywhere within the network to monitor your critical application traffic. They also can be redeployed to support new requirements, thus offering lasting investment protection. Application performance intelligence Characterize the end-user experience for TCP-based applications and isolate application response time problems to the network, server, or the application minimizing any triage process. Comprehensive voice quality monitoring and real-time troubleshooting Gather real-time reports on Mean Opinion Score (MOS) and other key performance indicators (KPIs) such as jitter and packet loss to understand and improve how the end user experiences the delivery of voice services. MOS is computed based on ITU-T Recommendations G.107 offering accurate characterization of voice quality. Combine monitoring with real-time troubleshooting using pre-packaged dashboards to improve the end-user service levels. WAN optimized networks visibility Obtain proof points demonstrating how WAAS has improved application delivery (for example, decreased application transaction times from client perspective or improved LAN data throughput). Detailed traffic analytics View short- and long-term performance data on hosts, conversations, and applications that use critical network resources. Historical analysis Look back to the past with the embedded Performance Database to understand what happened when an event that affects network performance occurred to accelerate root-cause analysis and prevent any reoccurrence. Use historical analysis for advancing optimization and capacity decisions. Deep, insightful packet captures Solve complex performance issues with trigger-based captures, filters, decodes and Packet Capture Error Scan features. Packet captures can be triggered based on performance thresholds allowing you to focus on specific performance issues. The captures can be initiated and analyzed remotely using the web-based user interface eliminating the need to travel to the remote site. Site-based Monitoring View network and application performance by logical groups or sites that you can create to mirror your network topology. For example, you can create sites by geographic locations, departments, or even managed customer networks. The feature facilitates tracking site-specific service-level objectives, resolving performance issues, or enforcing optimization policies. Pre- and post-deployment metrics Glean valuable before and after traffic analytics to help plan for and verify changes in network resources, such as introducing new applications, establishing QoS policies, consolidating servers, and deploying VoIP. Open interface Ease NAM configuration and export of computed NAM data using standards-based APIs (XML/REST for configuration, NetFlow Version 9 for data export). Anytime, anywhere access Access the web interface from any desktop, eliminating the need to send personnel to remote sites or haul large amounts of data over WAN links to the central site. The Cisco NAM 2200 Series Appliances deliver comprehensive intelligent application performance (IAP) measurements to accurately assess the end-user experience. 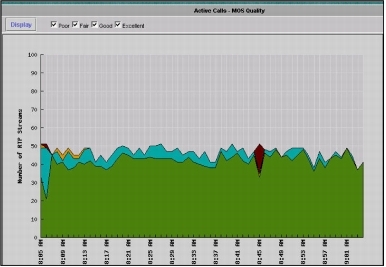 The Cisco NAMs analyze TCP-based client/server requests and acknowledgements to provide transaction-aware response time statistics such as client delay, server delay, network delay, transaction times, and connection status. This data can help you isolate application problems to the network or to the server. It can also help you quickly diagnose the root cause of the delay and thus resolve the problem while minimizing end-user impact. Figure 1 displays an application response time report for an HTTP application. The report shows how addressing an overloaded server improved the responsiveness of the application. IAP can assist busy IT staff in troubleshooting application performance problems, analyzing application behavior and trends for capacity planning, identifying application consolidation opportunities, defining and helping ensure service levels, and performing pre- and postdeployment monitoring of application optimization and acceleration services. Cisco Wide Area Application Services (WAAS) is a powerful application acceleration and WAN optimization solution that optimizes the performance of TCP-based applications operating in a WAN environment. The optimization allows IT organizations to consolidate costly branch-office servers and storage in centrally managed data centers and to deploy new applications directly from the data center while offering LAN-like application performance for any employee, regardless of location. In a WAAS deployment traffic is intercepted by the Wide-Area Application Engine (WAE) devices as an essential part of the optimization process. Traditional monitoring solutions lack the intelligence to understand how this process affects the application flows, thus providing measurements that fail to represent true response time, data transfer time, and other critical performance information. 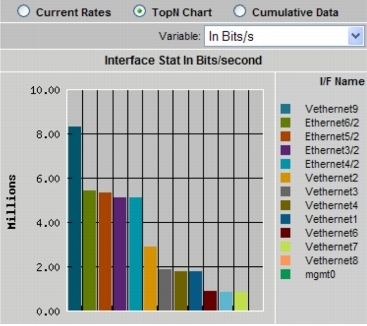 As a complementary component of the Cisco WAAS solution, the Cisco NAM Appliances use the instrumentation built into the WAE devices to gather flow data to accurately quantify the end-to-end application performance improvements, as is demonstrated in Figures 2 and 3. Additionally, the Cisco NAM Appliances can help assess which applications would benefit the most from deploying WAAS and can provide real-time visibility of ongoing optimization improvements. The Cisco® Nexus 1000V is a Cisco-developed server virtualization switching architecture for VMware ESX environments. The Nexus 1000V helps enable policy-based virtual machine (VM) connectivity, mobility of security and network properties, and a nondisruptive operational model for both server and network administrators. Offering a set of network features, management tools, and diagnostic capabilities consistent with the customer's existing physical Cisco network infrastructure and enhanced for the virtual world, the Nexus 1000V allows customers to accelerate their adoption of VMs throughout the unification and simplification of the physical and virtual networks. Voice traffic demands stringent availability and performance requirements. It is extremely sensitive to a number of parameters such as packet loss and jitter that do not affect transactional applications in the same way. Users expect near 100 percent uptime. The Cisco NAM Appliances can analyze voice streams in real time to provide critical performance information, including Mean Opinion Score (MOS), jitter, and packet loss, to increase your agility in identifying and resolving voice degradation issues. And complementing monitoring of voice streams, the Cisco NAMs can also monitor call signaling to derive important measurements like delays in call processing. For enterprisewide voice management, the Cisco NAM Appliances integrate with the Cisco Unified Communications Management Suite of products to help you define and enforce end-to-end service-level objectives to assure the consistent and optimized delivery of voice services. 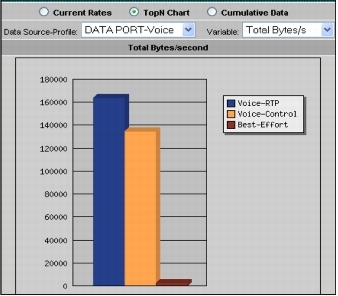 Figure 5 presents a last 60-minute view of voice quality for active calls. The NAMs allow filtering of the data by quality grade (Poor, Fair, Good, and Excellent) to help enable you to quickly identify anomalous behavior. One of the cornerstones of the Cisco NAM Appliances is their ability to look inside the live packet to gather information on applications, hosts, and conversations. Understanding which applications, hosts, and conversations are consuming bandwidth and by how much can help you proactively spot bottlenecks before they affect availability and performance. It can also help you improve the consistency and quality of both individual and overall network services since these metrics reveal usage patterns for users as well as for router and switch, interface, server, and application resources. 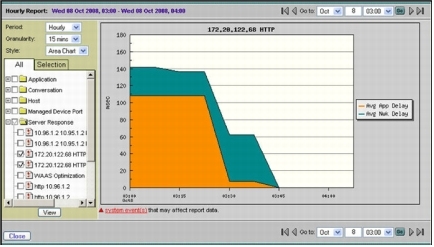 Besides delivering a real-time snapshot of bandwidth usage and consumption, the Cisco NAM Appliances also deliver a continuous historical view of how the bandwidth was used so you can quickly decide when and where to make changes in network resources including applying Cisco acceleration and control mechanisms (Figure 6). Data can also be collected over a select period of time and then analyzed after the event to discover when an anomaly has occurred so it can be immediately resolved. With the high performance Cisco NAM Appliances, you can set thresholds and alarms on various network parameters such as increased utilization, severe application response delays, and voice quality degradation and be alerted to potential problems. When one or more potential problem areas are identified, the packet can be automatically captured and decoded to help resolve the problem. Optionally, you can continuously capture packets to observe the conditions that were present when a problem occurred. Captures can be performed using a web browser from any desktop, and decodes can be viewed through the Traffic Analyzer GUI while the data is still being captured. The capture and decode capability of the Cisco NAM Appliances provides depth and insight into data analysis using trigger-based captures, filters, decodes, and a capture analysis toolset to quickly pinpoint and resolve problem areas (Figure 7). The Cisco NAM Appliances support both the planning and management of quality of service deployments for voice, video, and other critical IP-based services. It supports the Differentiated Services Monitoring (DSMON) MIB, which monitors traffic by differentiated services code point (DSCP) allocations defined by quality of service (QoS) policies. Using the Cisco NAM DiffServ monitoring capabilities, you can identify applications, hosts, and conversations participating in each grouping of DiffServ classes (Figure 8). You can use this information to validate and tune planning assumptions and QoS allocations and to detect incorrectly marked or unauthorized traffic. 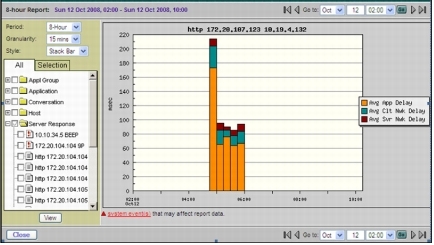 As flexible advanced Cisco instrumentation, the Cisco NAMs can export computed NAM data to third-party and homegrown applications to meet end-to-end performance reporting needs. 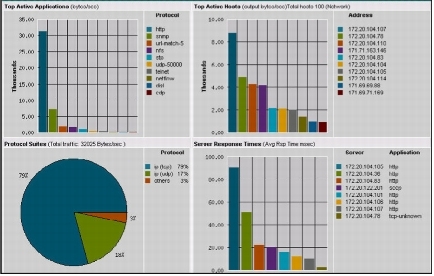 The application performance overview provided by these reporting applications can complement the granular performance visibility offered by Cisco NAMs to help enable you to monitor how applications are being delivered enterprisewide, yet isolate and resolve delivery problems proactively and promptly at their source. The Cisco NAM 2200 Series Appliances are dedicated performance monitoring instrumentation that connect to the Switched Port Analyzer (SPAN) ports of a switch using copper or fiber interface adapters. They can also connect to critical network links using third-party passive inline taps. They can be deployed in multiple places in the network and complement Cisco NAM blades to provide extensive network visibility. 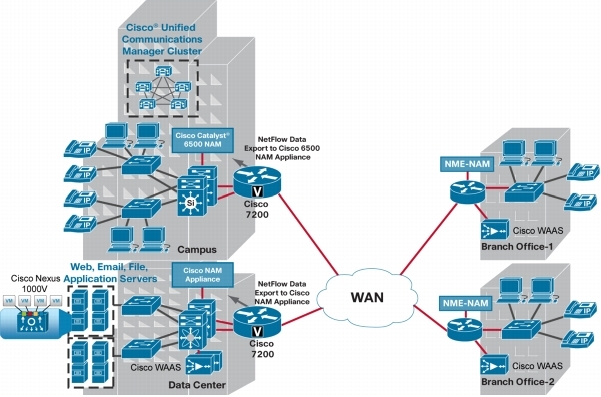 The Cisco NAM Appliances can be deployed at LAN aggregation points, for example, in the campus core and distribution layers, for always-on performance management; at services points, for example, in data centers or Cisco Unified Communications Manager clusters in IP telephony networks, where assuring application delivery is critical; and in important access points, close to servers, key clients, in IP phone closets, where troubleshooting is essential. They can also be deployed at WAN edges. Figure 1 highlights the deployment of the Cisco NAM 2200 Series Appliance along with the Cisco Catalyst 6500 Series NAM and the Cisco Branch Routers Series NAM to provide visibility within the borderless network. Cisco NAM 2200 Series Appliances use a rich set of Cisco infrastructure features to collect network and application traffic. Using the SPAN feature, Cisco NAMs can monitor traffic from physical ports, virtual LANs (VLANs), or Cisco EtherChannel connections. Using VLAN access control list (VACL)-based captures, traffic can be filtered before it is sent to Cisco NAMs to support the selective monitoring of large amounts of traffic or the gathering of traffic from WAN interfaces. 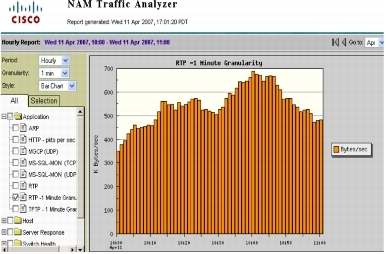 Using NetFlow Data Export (NDE), the Cisco NAMs can provide analysis of real-time and historical traffic usage to obtain a broad view of how the network is performing. They can also use the Remote SPAN (RSPAN) or Encapsulated Remote SPAN (ERSPAN) features of the devices to extend troubleshooting to remote parts of the network. By using the instrumentation built into the Cisco infrastructure, the Cisco NAM Appliances offer more ways to see and understand what's happening on your network. Tested platforms Tested with Catalyst 4500 Series, Catalyst 6500 Series, Cisco 7600 Series, and Nexus 7000 Series. Please read the NAM 4.2 Release Notes for any limitations that may apply. Protocols Cisco NAM provides RMON2 statistics on hundreds of unique protocols, including those defined in RFC 2896 and several Cisco proprietary protocols. 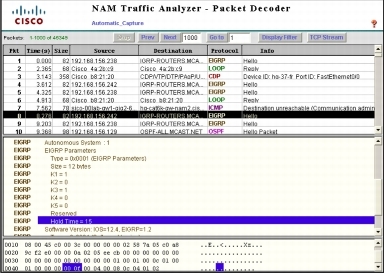 Cisco NAM automatically detects unknown protocols. Users have flexibility to customize the protocol directory by defining protocols on a single port or on a range of ports. Download the Cisco NAM 2200 Series Appliances Datasheet (PDF).